Do you know if you have water intruding into your basement or crawl space areas? 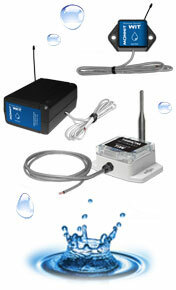 Monnit Wireless Water Sensors alert you of potential property damage that results from flooding or leaks. Place these sensors anywhere flooding or leaky plumbing could cause problems and the system will notify you if it detects the presence of any water. All Monnit wireless sensors come with FREE basic online sensor monitoring and alerting through the iMonnit Online Monitoring System which provides access to all of your sensor data and can alert you via SMS text or email if a user defined condition is met or exceeded. Updated MonnitLink™ Service Gateway On The Way! The Monnit Software development team is getting ready to release an updated MonnitLink™ USB Service Gateway. The updated gateway software will support all new and upcoming Monnit wireless sensors as well as automatically load when the host computer boots up. This helps prevent gateway shutdown when a Windows PC automatically restarts or if you forget to load the software when starting the computer. Let's take a look in our crystal ball to see what the future holds at Monnit? The Monnit development team is always working on products that will enhance our current product offering based on customer needs. We are exploring the potential of recent requests for Bluetooth capable temperature sensors that can be monitored directly via smart phone. If you would like to learn more about the development efforts of our team on this new product, please email us at sales@monnit.com. Some buildings and homes are built with crawl spaces that are difficult to get into and keep track of. Water in these crawl spaces can cause foundation and structural issues as well as create an environment for mold to grow. All of which are expensive to treat or repair. 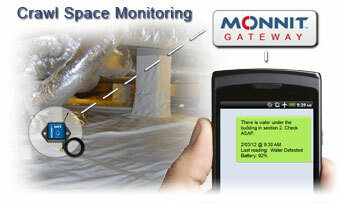 Using Monnit wireless sensors can help you keep track of these areas so damage does not occur. We recommend using Monnit's affordable wireless water sensors to monitor building basements and crawl spaces for the presence of water. 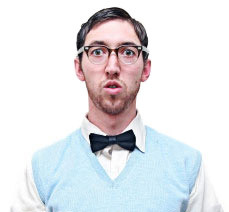 Know instantly about water intrusion, leaks and plumbing issues before costly damage occurs. Monnit wireless sensors track conditions for you, sending the information to the iMonnit Online Sensor Monitoring and Notification System where custom alerts can be sent via SMS text or email. 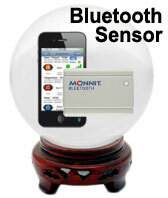 Detect issues before costly damage occurs with Monnit Wireless Sensors! There have been some recent changes made to the sensor configuration sections of iMonnit. This tech tip will help you better understand the changes and show you how to use some of the new features. To get started log into your iMonnit account at www.imonnit.com and click the edit button next to the sensor you wish to work with. Depending on the type of sensor you are editing the available settings may differ slightly. We will use a temperature sensor for this article. 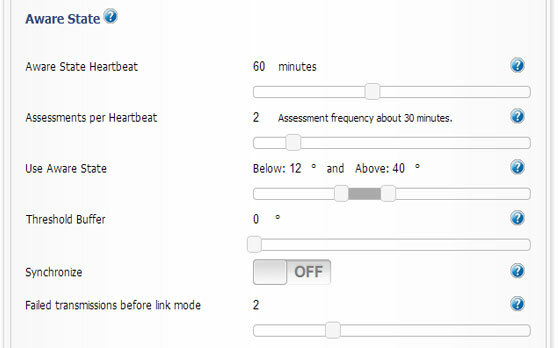 The top portion of the edit screen gives you the basic settings for the sensor such as: Sensor Name and Heartbeat Interval (how frequently the sensor will send readings). To make a change to a setting, click and drag the slider or click on the number to type using your keyboard. For measurement type sensors such as temperature, you will see a display unit selector (example: Celsius and Fahrenheit). You will also see a selector to choose whether the sensor should be active all day or only during certain times of the day. This is useful to monitor conditions only during daytime hours or nighttime hours. Click and slide these selectors to change their settings. 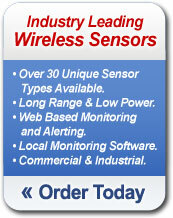 If you have an active Premiere subscription, you can truly customize the behavior of your wireless sensors. You can set an aware state heartbeat allowing you to get more frequent sensor readings when a threshold is exceeded. 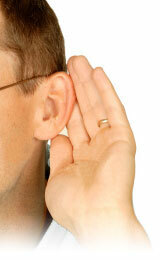 You can define how many times the sensor will check against the set thresholds between heartbeats. You get a high and low threshold for measurement type sensors. You can synchronize the sensors on your network so they all check in at the same time, and you have the ability to customize how many sensor heartbeats are missed before a sensor sleeps for two hours (default 2). To change any of these settings simply click and drag the slider buttons or click on the numbers to type with your keyboard. When you have finished making any changes to the sensor configuration page, click the "Save" button at the bottom of the screen to save the changes and return to the sensor details page. For more information on iMonnit Premiere Monitoring Click Here! The Monnit "Three Ring Rule"
In a competitive environment, winning your business can be as simple as picking up the phone. As such, Monnit has an internal policy called "The Three Ring Rule." It simply states that during Monnit business hours the phone shall not ring more than three times before a person answers (we HATE voicemail systems). Your call may be answered by reception, a sales guy, a development engineer, or even our CEO, but you will speak to a live person and they will direct your call accordingly. We value your business and the time you take to call us! All trademarks are property of their respective owners. © 2012 Monnit Corp. All Rights Reserved.